Court sends orders in Schneerson Library case to Russian Culture Ministry | Russian Legal Information Agency (RAPSI). MOSCOW, July 30 (RAPSI) - The Moscow Commercial Court has sent the Russian State Library and the Russian Ministry of Culture court orders that require the US and the US Library of Congress to return seven books from the Yosef Schneersohn Library to Russia, the court told RAPSI on Wednesday. On May 29, the Commercial Court upheld a lawsuit from Russia that requested the books be returned. The ruling was to take effect unless appealed by the Ninth Court of Appeals within a month. No appeals have been filed over this time hence the order came into force, the court’s press service announced. The court also ruled that the plaintiffs receive compensation in case of non-fulfillment of the ruling of $50,000 for each day of delay. 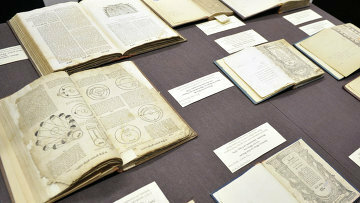 The seven books from the Russian State Library’s collection of rare Judaic literature were shipped to the United States in 1994 for temporary use under the interlibrary loan system. A representative for the plaintiff recalled that the loaned books were to be returned upon first request. In March 2013, the Russian State Library requested that the books be returned, which the US organization failed to do. The books are currently being held by a non-profit religious organization, Agudas Chassidei Chabad. The defendants, who were duly notified of the trial, were not present at the hearing. Gayle Osterberg, Director of Communications at the Library of Congress, commented on the lawsuit saying that the Library of Congress had never permitted any violations regarding the Schneerson Library. Lubavitcher Rebbe Yosef Yitzchok Schneerson was forced to leave the Soviet Union in 1927. He took his collection with him to Latvia and Poland where he left the books after Poland was attacked by Nazi Germany. The total collection was taken to Germany and confiscated by the Red Army in 1945. Schneerson died in 1950 without leaving instructions regarding the collection. On January 16, 2013, the US District Court for the District of Columbia ordered Russia to pay fines of $50,000 per day until it returns the books and manuscripts to America’s Hasidic community. Russia’s Foreign Ministry described the ruling as unlawful provocation. 17:30 30/07/2014 The Moscow Commercial Court has sent the Russian State Library and the Russian Ministry of Culture court orders that require the US and the US Library of Congress to return seven books from the Yosef Schneersohn Library to Russia, the court told RAPSI on Wednesday.